A systematic guide to some of the fundamental principles that lead to a comprehensive proficiency in drawing. In the space of eight weeks, we will summarise skills that can be repetitiously applied in a three to five year drawing course; thus giving the beginner the necessary tools in a short time, to build on principles they can practice and repeat over a life time. The underlying assumption guiding these classes, is that absolutely anyone can learn to draw. Suitable for both the very beginner and those with some prior experience. Cost of life model included in fee. Basic geometric shapes and perspective: We will start by drawing basic shapes, such as circles and squares; followed by spheres, cubes and cylinders. Having observed these shapes, we will attempt to draw them in relation to perspectival space and the directional fall of light. We will end by examining how more complex forms can be understood in terms of these basic shapes. Drawing and linear direction: Starting with a stick figure – an invaluable tool in describing the major centre lines of any form – we will gradually work towards conceiving of more complex forms in terms of two directional lines and basic geometric shapes, such as cylinders and cubes. The human figure and the refinement of directional lines: Employing a life model, we will see how we can apply the lessons gained from the Bargue drawing to the life model in terms of basic directional lines. We will integrate this knowledge with the exercises in geometry and perspective addressed in the previous classes. Jacopo Pontormo (1494 – 1557) - Basic gesture and action in the human figure: Taking the Renaissance artist Pontormo as a guide, we will see how the figures weight is employed to express movement and action. Tintoretto (1518 – 1594) - Gesture and action with basic anatomical masses, landmarks and limited convexed contours: Observing the dynamic forms evident within the work of the Venetian Master Tintoretto, we will introduce some very basic anatomical landmarks to better structure our drawing. Raphael Sanzio (1483 – 1520) – the figure as line and contour: We will begin to see the independent role contour plays in articulating both form and volume. Rendering, Shading and Cross hatching: In this class we will learn from the engravings of a Venetian drawing manual. The manual was specifically designed to assist in the comprehension of shading for the purpose of conveying a believable sense of form. Sustained pose: In this final class we will bring together all the elements so far addressed. Additional attention will be given to shading at the turning point of the models form into shadow. We will look at ways to convey an inferred sense of surrounding depth and background in a figure drawing, by giving the illusion of weight with minimal use of cast shadows. We will also learn to employ a paper stump over a shaded background, contrasted against the lighter values of the figure, in order to further convey a subtle illusion of receding space. Begin to understand and grasp the processes of conceptualising, selecting and creatively inventing any form. Understand the basic principles of suggesting form with line alone. Make use of and/or inventing a light source to model form. 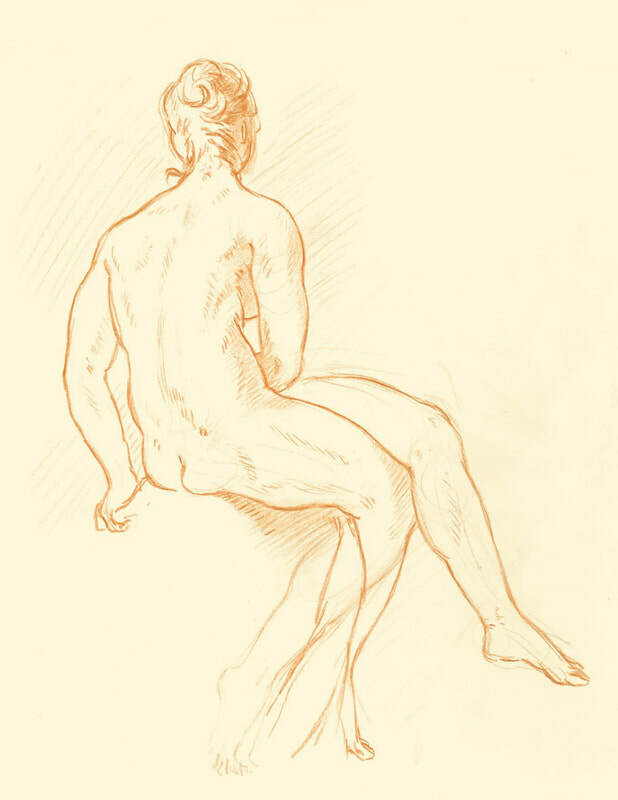 Identify techniques and make use of Old Master drawings within a contemporary drawing practice. Learn how to treat the figure as a “mannequin” rather than a static object to mindlessly copy and reproduce.